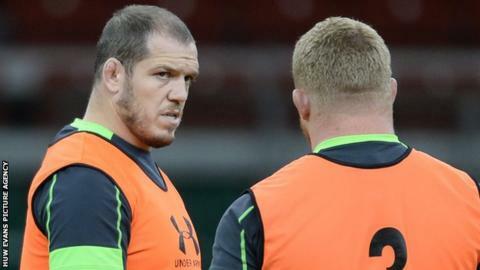 Injured Wales props Samson Lee and Paul James are facing a race against time to be fit for the World Cup match against England on Saturday. Both men suffered calf strains during the 54-9 win over Uruguay and attack coach Rob Howley said the pair "are being assessed hour by hour". But full-back Liam Williams - also injured against Uruguay - trained on Wednesday, as did lock Alun Wyn Jones. Wales name their team to play England at 11:00 BST on Thursday. If either Lee or James are not fit, Wales will have to call up a replacement prop in time to play on Saturday to provide specialist front-row cover. Whoever is replaced in the squad will not be able to play again in this tournament, but Howley said the tournament organisers had confirmed Wales could delay the decision until 24 hours before kick-off. "Aaron [Jarvis] is fine, it's just Samson and Paul James we're waiting on. Time is running out and we have to make that decision over the next 24 hours," said Howley. "Samson is a little in front of Paul in terms of recovery, but we'll just have to wait and see. "It's up to our medical team to make that call and it's just hour by hour and we'll have to wait and see the timing on that." Howley admitted that "there are props on standby" but declined to say which players were awaiting a call. British and Irish Lions second row Jones is also taking a full part in training having not played since injuring his knee in August's World Cup warm-up win against Ireland. "Liam and Alun Wyn trained fully this morning and are ready to go, our two props are still being assesses and hopefully we'll have some good news over the next 24 to 48 hours," said Howley. Howley reacted to leaks suggesting Sam Burgess and Owen Farrell would start against them at Twickenham by claiming it would have no bearing on Wales' selection. "As far as I know that's just speculation at the moment," he said. The former Wales scrum-half added that Burgess' physical presence would not be a new experience for Wales centre Jamie Roberts. "If you look around world rugby at players like [New Zealand centre] Ma'a Nonu - it's just a case of welcome to international rugby," he added. "We don't want other teams to dictate our selection. "Our preparation in the 10/12/13 axis - whether it's [George] Ford, [Brad] Barritt and Burgess or Ford, Burgess and [Henry] Slade - we just have to make sure you've been working on those attacking principles. "It's no different for us, we just have to prepare to play against those players and make sure we do our jobs."